Kundapur, Mar 26, 2019: More than 81 people, including children, fell ill allegedly after consuming ice candy in Belve, Bidkalkatte, Hengavalli and Thombathu villages near Kundapur. They were admitted to Primary Health Centres at Belve and Bidkalkatte. Taluk Health Officer Nagabhushan told media that of these patients, 42 were from Belve and 25 from Bidkalkatte. Of the 42 persons, 33 received treatment and were discharged, there could be others with mild complaints who did not report. And, nine persons, including two children, were sent to the Taluk Government Hospital in Kundapur for treatment. They are out of danger, he stated. Of the 25 affected persons in Bidkalkatte, 10, who were admitted to the PHC in Bidkalkatte, took treatment and got discharged, while 15 patients received treatment as outpatients. Later, three cases were referred to the Government Hospital in Kundapur, Dr. Nagabhushan said. Chief Medical Officer, Taluk Government Hospital in Kundapur, Robert Rebello said that 16 persons, six adults and 10 children, from Hengavali, Belve and Thombathu villages had been admitted to the hospital in Kundapur on March 25, Monday. Two men and seven children got admitted to the hospital complaining of vomiting and loose motion. According to them, they consumed ice candy and that was the reason for their illness. They are stable, he said. Later, seven persons, four adults and three children, were admitted to the hospital with the same complaint. Of the seven persons, a 47-year-old woman was serious and in the Intensive Care Unit of the hospital. The rest are responding to medical treatment. All the 16 patients complained of fever, vomiting and loose motion. “Stool samples had been collected and sent for tests,” he said. 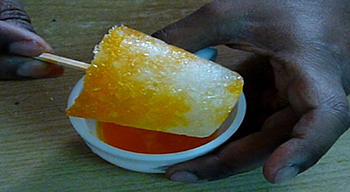 Dr. Nagabhushan said that as all patients had eaten ice candy, it must be either food or water contamination during the preparation of ice candy. “Definitely it is bacterial infection,” he said. However, Dr. Rebello said that the cause would be known only after investigation. Negligence, always prefer hygiene foods.